Absorbable copolymers are fabricated from the random polymerization of 1,4 dioxane-2-one and 1,3 dioxane-2-one monomers. The copolymers are useful in forming surgical articles, including both monofilament and multifilament sutures. Absorbable copolymers fabricated from the random copolymerization of 1,4 dioxane-2-one and 1,3 dioxane-2-one monomers, and more particularly surgical articles made totally or in part therefrom, including both monofilament and multifilament sutures are provided. Polymers and copolymers of, and surgical devices made from lactide and/or glycolide and/or related compounds are well-know. See, e.g., U.S. Patent Nos. 2,668,162, 2,683,136, 2,703,316, 2,758,987, 3,225,766, 3,268,486, 3,268,487, 3,297,033, 3,422,181, 3,442,871, 3,463,158, 3,468,853, 3,531,561, 3,565,869, 3,597,449, 3,620,218, 3,626,948, 3,636,956; 3,736,646, 3,739,773, 3,772,420, 3,733,919, 3,781,349, 3,784,585, 3,792,010, 3,797,499, 3,839,297, 3,846,382, 3,867,190, 3,987,937, 3,878,284, 3,896,802, 3,902,497, 3,937,223, 3,982,543, 4,033,938, 4,045,418, 4,057,537, 4,060,089, 4,137,921, 4,157,437, 4,243,775, 4,246,904, 4,273,920, 4,275,813, 4,279,249, 4,300,565, and 4,744,365, U.K. Pat. or Appln. Nos. 779,291, 1,332,505, 1,414,600 and 2,102,827, D.K. Gilding et al., "Biodegradable polymers for use in surgery-polyglycolic/poly (lactic acid) homo-and copolymers: 1, "Polymer, Volume 20, pages 1459-1464 (1979), and D. F. Williams (ed.) Biocompatibility Of Clinical Implant Materials, Volume II, chapter 9: "Biodegradable Polymers" (1981). Surgical devices prepared from copolymers containing dioxanone and polycarbonates are known in the art. U.S. Patent No. 4,052,988 describes random copolymers containing dioxanone and up to 50 percent by weight of other copolymerizable monomers which produce non-toxic and absorbable copolymers. U.S. Patent 5,037,950 describes copolymers having sequential units of rho-dioxanone and sequential units of either tetramethylene carbonate, pentamethylene carbonate, hexamethylene carbonate, heptamethylene carbonate, octamethylene carbonate, nonamethylene carbonate, decamethylene carbonate, undecamethylene carbonate, and dodecamethylene carbonate, with hexamethylene carbonate being preferred. The '950 patent describes neither random copolymers nor copolymers containing trimethylene carbonate. As yet a further example, U.S. Patent 5,145,945 generically describes random copolymers of trimethylene carbonate and dioxanones other than carbonates. In addition, see U.S. Patent Nos. 4,891,263; 4,916,193; 4,902,203; and 5,152,781. As described above bioabsorbable sutures are known in the art. However, in the manufacture of sutures an important characteristic of a suture is the amount of effort typically required to straighten the suture upon its removal from the package in order to ready the suture for use. This effort appears to be related to the "strain energy" of the suture, i.e., the integration of the stress-strain curve for the suture measured in kilogram-mm, and is equivalent to the work expended in elongating the monofilament by a specified percentage of its original length. As the strain energy of a given size of suture decreases so, too, does the amount of effort required to straighten the suture prior to use. A decrease in strain energy also appears to relate to the perceived flexibility of the suture. Therefore, it would be advantageous to provide a bioabsorbable suture which exhibits desired absorption profile and improved flexibility and handling characteristics when compared to commercially available sutures having the same absorption profile, while maintaining other desired properties, such as knot-pull strength and straight-pull retention. It has now been found that absorbable surgical articles may be formed from the random copolymerization of 1,4 dioxane-2-one and 1,3 dioxane-2-one. Preferably, copolymers useful in forming surgical articles in accordance with the present invention include copolymers comprising a predominant component of dioxanone. A "predominant component" is a component which is present is an amount greater than 50 percent. In a particularly useful embodiment these block copolymers of may be spun into fibers. The fibers can be fabricated into both monofilament and braided multifilament sutures. Preferably copolymers useful in this embodiment include at least about 60 mole percent dioxanone, the remainder being trimethylene carbonate. There is also provided a process for manufacturing a suture exhibiting excellent flexibility and/or increased knot performance for a given size comprising the operations of extruding the block copolymer of the present invention at an extrusion temperature of from about 80°C to about 140°C to provide a monofilament fiber, stretching the solidified monofilament at a temperature of from about 30°C to about 60°C in water (or other suitable liquid medium such as for example glycerol) or at from about 30°C to about 95°C in air (or other suitable gaseous medium) at a stretch ratio of from about 3:1 to about 10:1 to provide a stretched monofilament. The stretched monofilament preferably is then frozen at a temperature of from about -25°C to about 0°C. The suture then may be annealed with or without relaxation at a temperature of from about 40°C to about 95°C to provide the finished suture. Fig. 1B is a modification of the apparatus of Fig. 1A which is particularly suitable for manufacturing the monofilament sutures of the present invention of smaller size, e.g., sizes 3/0 and smaller. Fig. 3A-3C illustrate the formation of the knot which was employed in the loop-pull test used in Example 3. It has been found that monomers of 1,3 dioxane-2-one and 1,4 dioxane-2-one (with 1,4 dioxane-2-one as the predominant component thereof) can advantageously be randomly copolymerized to form a copolymer useful in forming surgical sutures. Such random copolymers include copolymers having at least 50 mole percent 1,4 dioxane-2-one. Preferably, 1,4 dioxane-2-one makes up at least about 60 mole percent of the copolymer. Most preferably, 1,4 dioxane-2-one comprises at least about 80 percent of the copolymer, with about 93 mole percent being preferred. The 1,4 dioxane-2-one may be copolymerized with any soft phase forming monomer, with trimethylene carbonate being preferred. These copolymers can be synthesized by known methods. See, for example. U.S. Patent Nos. 4,653,497; 4,838,267; 4,605,730; and 4,788,979 the disclosures of which are incorporated herein by reference. Such copolymers of 1,3 dioxane-2-one and 1,4 dioxane-2-one have a molecular weight such that they exhibit an inherent viscosity of from about 1.2 to about 2.5 dl/g measured at 30.C and a concentration of 0.25 g/dl in hexafluoroisopranol (HFIP) are useful. Although it is preferred to fabricate surgical sutures from these copolymers, a wide variety of surgical articles can be manufactured from the copolymers disclosed herein. These include but are not limited to clips and other fasteners, staples, sutures, pins, screws, prosthetic devices, wound dressings, drug delivery devices, anastomosis rings, and other implantable devices. Fibers made from the copolymers of this invention can be knitted or woven with other fibers, either absorbable or nonabsorbable to form meshes or fabrics. The copolymers herein can also be used as an absorbable coating for surgical devices. The copolymers of this invention can be formed into surgical articles using any know technique, such as, for example, extrusion, molding and/or solvent casting. The copolymers can be used alone, blended with other absorbable compositions, or in combination with non-absorbable components. Multifilament sutures of the present invention may be made by methods known in the art. Braid constructions such as those disclosed and claimed in U.S, Patent No. 's 5,059,213 and 5,019,093 are suitable for the multifilament suture of the present invention. A suitable process for the manufacture of monofilament sutures includes the operations of melt extruding the resin at an extrusion temperature of from about 80°C to about 140°C to provide a monofilament, stretching the solidified monofilament at a temperature of from about 30°C to about 60°C in water (or other suitable liquid medium) or at from about 25°C to about 95°C in nitrogen (or other suitable gaseous medium) at a stretch ratio of from about 3:1 to about 10:1 to provide a stretched monofilament. Optionally, the solidified monofilament may be stretched at least once in air or other suitable gaseous medium preferably at about 70.C. Preferably, the monofilament is then frozen at a temperature of from about -25°C to about 0°C. The suture may then be annealed at a temperature of from about 40°C to about 95°C to provide the finished suture. Fig. 1A schematically illustrates a monofilament suture manufacturing operation which is especially suitable for producing larger size sutures, e.g., those of sizes 2/0 and larger. Extruder unit 10 is of a known or conventional type and is equipped with controls for regulating the temperature of barrel 11 in various zones thereof, e.g., progressively higher temperatures in three consecutive zones A, B and C along the length of the barrel. Pellets or powder of resins of the present invention are introduced to the extruder through hopper 12. Any of the copolymers described in this application which are useful for the formation of fibers can be used herein. Optionally, about 0.01 to about 0.1 percent by weight of a plasticizer such as calcium stearate may be added along with the copolymer to extruder 10. Motor-driven metering pump 13 delivers melt extruded resin at a constant rate to spin pack 14 and thereafter through spinneret 15 possessing one or more orifices of desired diameter to provide a molten monofilament 16 which then enters quench bath 17, e.g., containing water, where the monofilament solidifies. The distance monofilament 16 travels after emerging from spinneret 15 to the point where it enters quench bath 17, i.e., the air gap, can vary and can advantageously be from about 0.5 to about 100 cm and preferably from about 1 to about 10 cm. If desired, a chimney (not shown), or shield, can be provided to isolate monofilament 16 from contact with air currents which might otherwise affect the cooling of the monofilament in an unpredictable manner. In general, barrel zone A of the extruder can be maintained at a temperature of from about 80°C to 105°C, zone B at from about 100°C to 105°C and zone C at from about 100°C to about 110°C. Additional temperature parameters include: metering pump block 13 at from about 100°C to about 110°C, spin pack 14 at from about 100°C to about 120°C, spinneret 15 at from about 95°C to about 120°C and quench bath at from about 10°C to about 30°C. Monofilament 16 is passed through quench bath 17 around driven roller 18 and over idle roller 19. Optionally, a wiper (not shown) may remove excess water from the monofilament as it is removed from quench bath 17. On exiting the quench bath the monofilament enters first godet station generally indicated at 21. First godet station 21 is equipped with five individual godets around which monofilament 16 is wrapped. First godet 23 is provided with nip roll 22 to prevent slippage which might otherwise result. Upon entering first godet station 21, monofilament 16 passes over first godet 23, under second godet 24, over third godet 25, under fourth godet 26 and over fifth godet 27. Fifth godet 27 is proximally located to separation roller 28 which is provided with a plurality of laterally spaced circumferential grooves which act as guides for monofilament 16. After monofilament 16 passes over fifth godet 27 it wraps around a groove on separation roller 28 and extends back to and around a corresponding groove on separation roller 29 located proximal to first godet 23. Monofilament 16 wraps around separation roller 29, ascends up to first godet 23 and continues onward to the remaining godets in the manner just described. When the monofilament passes over the fifth godet 27 a second time, it may be wrapped around a second groove on separation roller 28. The monofilament then extends back to separation roller 29 and around a corresponding groove thereon. The monofilament may pass through first godet station 21 any desired number of times. The solidified monofilament is thus allowed to dwell at ambient conditions before the monofilament,enters heating unit 30. In this fashion monofilament 16 is aged or exposed to ambient conditions for a desired period of time prior to being stretched. It is to be understood that aging or exposing the monofilament to ambient conditions for a predetermined period of time prior to drawing the monofilament can be accomplished in many different ways. For example, any number of godets may be employed to provide the dwell period. In addition, the arrangement of the godets can be varied. Also, other structure suitable for providing aging of the monofilament prior to stretching will be apparent to those skilled in the art. Monofilament 16 passing from godet 27 is stretched, e.g., with stretch ratios on the order of from about 2:1 to about 7:1 and preferably from about 3:1 to about 5:1, to effect its orientation and thereby increase its tensile strength. Stretching may be achieved by drawing the monofilament at ambient temperatures or drawing the monofilament while or after it has been heated. In the stretching operation shown in Fig. 1A, generally suitable for larger size sutures, e.g., sizes 2 to 2/0, monofilament 16 is drawn through hot glycerol or hot water (or other suitable liquid medium) draw bath 30 by means of godets 104, 105, 106, 107 and 108 or any other suitable arrangement of godets which rotate at a higher speed than godet station 21 to provide the desired stretch ratio. The temperature of hot water draw bath 23 is advantageously from about 30°C to about 60°C and preferably is from about 40°C to about 50°C. In the alternative stretching operation shown in Fig. 1B, generally preferred for smaller sutures sizes, e.g., sizes 3/0 to 8/0, monofilament 16 is drawn by godets 104, 105, 106, 107, and 108 or any other suitable godet arrangement through hot air convection oven chamber 30' at a temperature of from about 30°C to about 95°C and preferably from about 40°C to about 60°C to provide the desired amount of stretch. Following the stretching operation shown in Fig. 1A or 1B, monofilament 16 optionally may be subjected to an on-line annealing and/or additional stretching without shrinkage or relaxation with shrinkage operation as a result of which the monofilament shrinks. In the processes of Figs. 1A and 1B, on line annealing with or without relaxation when desired is accomplished by driving monofilament 16 by godets 36, 109, 110, 111, and 112 or any other suitable godet arrangement through second hot air oven chamber 35 at a temperature of from about 40°C to about 95°C and preferably from about 50°C to about 80°C. During the relaxation process, at these temperatures, monofilament 16 will generally recover to within about 80 to about 98 percent, and preferably to within about 90 percent, of its pre-annealed length to provide the finished suture. For relaxation, the third godet station rotates at a slower speed than the second godet station thus relieving tension on the filament. Annealing of the suture also may be accomplished without shrinkage of the suture. In carrying out the annealing operation, the desired length of suture may be wound around a creel and the creel placed in a heating cabinet maintained at the desired temperature, e.g. about 40.C to about 95.C, as described in U.S. Patent No. 3,630,205. After a suitable period of residency in the heating cabinet, e.g., about 6 hours or so, the suture will have undergone essentially no shrinkage. As shown in U.S. Patent No. 3,630,205, the creel may be rotated within the heating cabinet in order to insure uniform heating of the monofilament or the cabinet may be of the circulating hot air type in which cage uniform heating of the monofilament will be achieved without the need to rotate the creel. Thereafter, the creel with its annealed suture is removed from the heating cabinet and when returned to room temperature, the suture is removed from the creel, conveniently by cutting the wound monofilament at opposite ends of the creel. The annealed sutures, optionally attached to surgical needles, are then ready to be packaged and sterilized. 1,3 dioxane-2-one (750 grams) and 1,4 dioxane-2-one (4250 grams) are added to a reactor along with 1.0 grams of stannous chloride and 1 gram of diethylene glycol. The mixture is heated and placed at 100.C, with stirring under a nitrogen atmosphere for 25 hours. The temperature is then reduced to 90.C and stirring continued for 5 hours. The 1,3 dioxane-2-one / 1,4 dioxane-2-one copolymer is then sampled. The reaction product is isolated, comminuted, and treated to remove residual reactants using known techniques. The copolymer is then heated under vacuum to remove residual water, residual solvent, and/or unreacted monomer. 1,3 dioxane-2-one (750 grams) and 1,4 dioxane-2-one (4250 grams) are added to a reactor along with 0.5 grams of stannous chloride and 1 gram of diethylene glycol. The mixture is heated and placed at 100.C, with stirring under a nitrogen atmosphere for 24 hours. The temperature is then reduced to 90.C and stirring continued for 8 hours, followed by stirring for 1 hour at 150.C, and stirring for 15 hours at 90.C. The 1,3 dioxane-2-one / 1,4 dioxane-2-one copolymer is then sampled. Measurements of knot pull, percent elongation, tensile strength and strain energy were carried out employing an Instron Corporation (Canton, Mass.) Tensile Tester, model no. 1122, equipped with yarn grips and operated with a gauge length of 127 mm and a crosshead speed of 127 mm/min and 51 mm/min for straight-pull and knot-pull, respectively. The physical properties of monofilament sutures produced in accordance with the conditions of Table I were measured at 21.C and 50 percent relative humidity. As the data in Tables III and IV illustrate, the suture made of the copolymer of the present invention showed improved flexibility while demonstrating acceptable physical properties, such as knot-pull and straight-pull strength. To simulate in vivo conditions, the suture samples were stored in a container filled with Sorenson's buffer solution at 37.C. After various periods of time, the suture samples were then removed from the container to test their loop-pull strength. as follows. A knotted loop was formed in a test suture in three steps as shown in FIGS. 3A - 3C. As shown in step 1 of FIG 3A, each suture was given a double throw (left over right ) around a 2 cm diameter cylinder. In Step 2, the free ends of the suture were set in a single throw (right over left) onto the initial throw of step 1. Finally, in step 3, another double throw ( left over right) was set onto the single throw of Step 2 to complete the knot. The free ends of the suture were cut to approximately 0.5 inches and the loop was carefully eased from the cylinder. Testing of the loop was carried out using an Instron Corporation (Canton, Mass.) Tensile Tester Model No. 4301, operated with a crosshead speed of 25 mm/min and equipped with flat grips, each having a pin over which the loop is positioned. The results of the tests, are presented in Table V hereinbelow. In the strength retention data reported in Table V, Tn represents the time elapsed in weeks since the sample was placed in the solution, with n representing the number of weeks. As the data in Table V demonstrates, the suture of Example 1 further exhibits an in vitro strength retention greater than Monocryl and less than Maxon and PDSII. It will be understood that various modifications may be made to the embodiments disclosed herein. Therefore the above description should not be construed as limiting, but merely as exemplications of preferred embodiments. Those skilled in the art will envision other modifications within the scope and spirit of the claims appended hereto. A medical device comprising a suture-needle combination comprising a filament spun from a random copolymer containing at least about 60 mole percent 1,4 dioxane-2-one and about 40% mole percent 1,3 dioxane-2-one. The device of claim 1 wherein the random copolymer contains about 60 mole percent 1,4 dioxane-2-one and about 40 mole percent 1,3 dioxane-2-one. The device of claim 1 wherein the random copolymer contains at least about 80 mole percent 1,4 dioxane-2-one. The device of claim 1 wherein the random copolymer contains at least about 93 mole percent 1,4 dioxane-2-one. The device of claim 1 wherein the random copolymer possesses an inherent viscosity of abut 1.2 to about 2.5 dl/g at 30°C and a concentration of 0.25 g/dl in hexafluoroisopranol (HFIP). The device of claim 1 comprising a medico-surgically useful substance. A surgical article formed totally or in part from a random copolymer comprising about 60 mole percent 1,4 dioxane-2-one and about 40 mole percent 1,3 dioxane-2-one. The surgical article of claim 6 wherein the random copolymer comprises at least about 90 mole percent 1,4 dioxane-2-one. The surgical article of claim 7 wherein said surgical article is selected from the group consisting of clips, staples, sutures, pins, screws, prosthetic devices, anastomosis rings, and growth matrices. The surgical article of claim 9 wherein said suture is a monofilament suture. A monofilament suture fabricated from a random copolymer comprising a copolymer of 1,4 dioxane-2-one and 1,3 dioxane-2-one exhibiting a knot pull value for a given size as follows: Size Knot pull value 3/0 about 2 kg. to about 2.4 kg. A monofilament suture fabricated from a random copolymer comprising 1,4 dioxane-2-one and 1,3 dioxane-2-one, size 3/0 exhibiting a straight pull value of about 2.8 kg. to about 4 kg. b. passing said needled suture through tissue to create wound closure. b. stretching the solidified monofilament at a stretch ratio of from about 3:1 to about 10:1 to provide a stretched monofilament. b. annealing said stretched monofilament at a temperature of from about 40.C to about 95.C to provide a finished suture, the annealing resulting in shrinkage of the monofilament for a recovery to within about 80 to about 98 percent of the length of the monofilament prior to annealing. 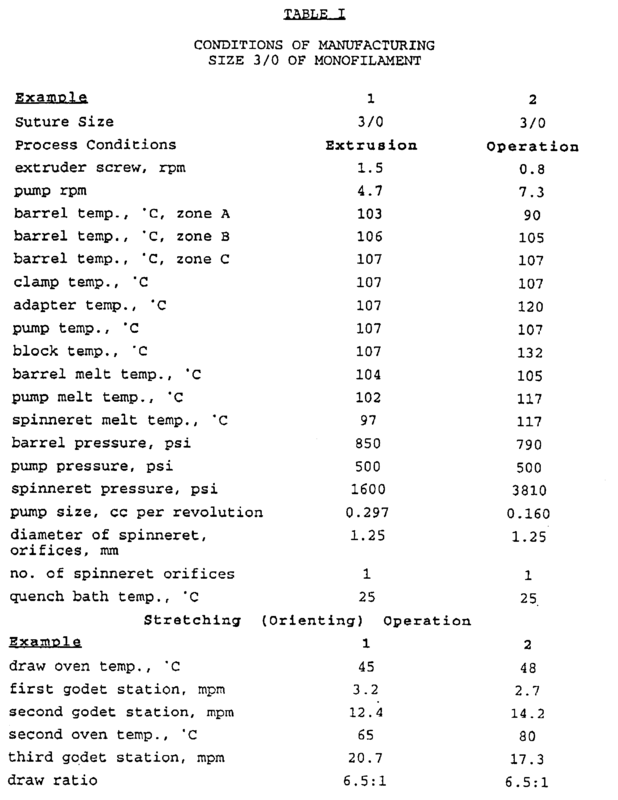 The process of claim 17 further comprising the step of freezing said stretched monofilament at a temperature from about -25.C to about 0.C, the annealing being accomplished without shrinkage. The process of claim 17, further comprising mixing a plasticizing agent with the random copolymer prior to the step of extrusion.